That’s a staggering amount of money for such a small group of people — and it’s just one specialty medication. The drug in question — Harvoni from Foster City, Calif.-based Gilead Sciences Inc. — can cure Hepatitis C, a communicable virus that destroys the liver. The prescription medication’s success can avoid the high cost of a liver transplant to save a patient’s life, plus the ongoing costs of anti-rejection drugs for years afterward. The drug’s success rate and high cost pose a dilemma for health insurers and employers, who are paying the rapidly rising bill for the new generation of medications that can treat or cure complex diseases. The catch: Those specialty drugs often come with an enormous price tag. “As outrageously expensive as some of these drugs are, we have to realize there is an economic benefit at the end of the day because of the condition that it’s treating,” said Bob Hughes, the owner and president of Advantage Benefits Group Inc. in Grand Rapids. Hughes calls the high costs associated with specialty drugs “a tidal wave” coming at employers. As the costs of specialty drugs continue to rise and their use grows, Hughes and others suggest that employers need to take a balanced approach in response. They should have a pharmacy benefit in place that’s designed to control costs as well as help employees who are hit with a complex or genetic-based disease to have access to specialty drugs that can treat their conditions. In the case of Harvoni for Hepatitis C — which costs more than $1,000 per dose and must be taken for 82 days — “the opposite of not taking that drug can be a lot worse,” Hughes said. 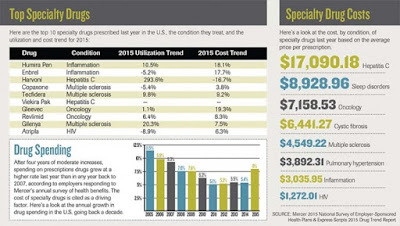 The high cost of specialty drugs has been a growing trend over the last few years. However, employer awareness of the resulting cost implications depends on the type of health coverage the company uses, said Shannon Enders, a partner at Lakeshore Employee Benefits in Muskegon. For fully insured employers that are part of a larger risk pool, “I just don’t think it’s resonating,” Enders said. Self-funded employers have the exact opposite reaction. Employers with fully-insured health coverage typically already have measures built into their benefits packages by their insurance carriers to address the issue. Self-funded employers should make sure their pharmacy coverage does the same, Enders said. Employers also should make sure their pharmacy benefit requires pre-authorization for a specialty drug and that it has steps built in so patients must first try a lower-cost drug that can treat their conditions, Hughes said. If it doesn’t work for them, then they can move on to the high-cost specialty drug. Benefits packages also can require a prescription for a specialty drug to be filled only halfway the first time, such as for a 15-day supply instead of a month’s worth. If a specialty drug doesn’t work for specific patients, or if they are unable to tolerate the side effects and need to change to another medication, then there’s less waste involved, Hughes said. Requiring or encouraging the use of and directly contracting with specialty pharmacies can help to control costs, as can adopting a tiered drug formulary that designates “preferred” and “non-preferred” specialty drugs with escalating co-pays. Employers can also add stop-loss coverage to their pharmacy benefits. An employer should set drug co-pays at levels that encourage the use of lower-cost options first or the use of a specialty pharmacy, Hughes said. He also advises clients to start learning about their options and educating employees about the cost implications and why they may have to pay a higher co-pay for a specialty drug. Hughes cautions about the use of coupons from pharmaceutical companies that wave the initial drug co-pay, insulating the employee from the actual cost. That can lead to patients starting on the expensive drug because they had a coupon, never having tried a lower-cost option for their conditions because it has a co-pay, he said. Research showing the high cost of specialty drugs coming to the market has been emerging the last few years. After four years of spending increases that ranged from 5.1 percent to 5.5 percent, the nearly 2,500 employers responding to Mercer’s 2015 national survey of health care coverage reported that their prescription benefit cost grew 8 percent. Half of the respondents that had the ability to break out data reported that their cost for specialty drugs grew 22 percent in 2015, according to Mercer. Express Scripts, a St. Louis-based pharmacy benefit manager, reported in March that overall drug spending in the U.S. increased 5.2 percent in 2015. Spending on specialty drugs alone grew 17.8 percent. Specialty drugs in 2015 accounted for 37.7 percent of all drug spending in the U.S., according to an annual trend report by Express Scripts. The company projects that to grow to 50 percent by 2018. It also noted that pharmaceutical companies presently are developing some 7,000 potential new specialty drugs, many for the high-use areas of oncology, neurologic disorders and infectious diseases. Among the drivers for the higher spending are increased prices charged by pharmaceutical companies. Express Scripts cites an increase of more than 18.1 percent last year in the price for Humira and a 17-percent increase for Enbrel, both of which are used to treat inflammation. Express Scripts predicts that total drug spending will increase by 6 percent to 8 percent annually between 2016 and 2018 in the U.S. Spending on specialty drug spending, led by medications to treat inflammatory conditions and new drugs to treat cancer, will increase an average of 17 percent annually over the next three years, according to the company. Quite often for insurers, the cost for specialty drugs stems from a relatively small number of people who need those prescriptions. About 1 percent of Priority Health’s 650,000-plus members typically use a specialty drug at any given time, accounting for about 40 percent of all drug spending by the Grand Rapids-based health plan. That cost “has been creeping up” by three to four percentage points a year, said Steve Marciniak, Priority Health’s vice president of pharmacy programs. Priority Health’s overall drug spending increased by more than 10 percent in 2015, after trending in the single digits in prior years, Marciniak said. The cost increases for specialty drugs have forced health plans to respond. Insurers are giving heavy scrutiny to new specialty drugs coming onto the market and are evolving their business practices accordingly. The key is assuring a specialty drug is medically necessary and appropriately prescribed for patients and their conditions.